1945: MI6 agent Paul Dark takes part in a top-secret mission to hunt down and execute Nazi war criminals. He will discover that everything he understood about that mission, about its consequences, and about the woman he once loved, has been built on false foundations. 1969: a KGB colonel called Slavin walks into the High Commission in Lagos, Nigeria, and announces that he wants to defect. He has information which indicates that there is yet another double agent within the Service – a devastating blow to an agency still coming to terms with its betrayal by Kim Philby and the rest of the Cambridge Five. Dark has been largely above suspicion during those years of self-recrimination. But now he can see his number coming up. For some it would be fight or flight time. But when you discover that everything you’ve taken for granted and trusted for twenty-four years is untrue, and when your arrest may only be moments away, then flight and fight may be your only option. 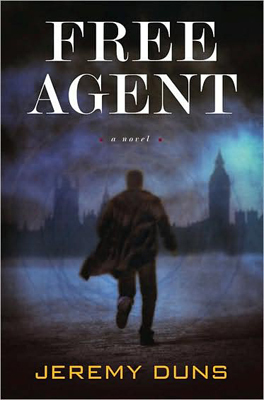 Free Agent is a twisting, intense thriller set between London and Nigeria during the height of the Cold War. It’s a novel of innumerable cliffhangers within a constantly evolving moral universe, and it keeps the surprises coming until the very last page.